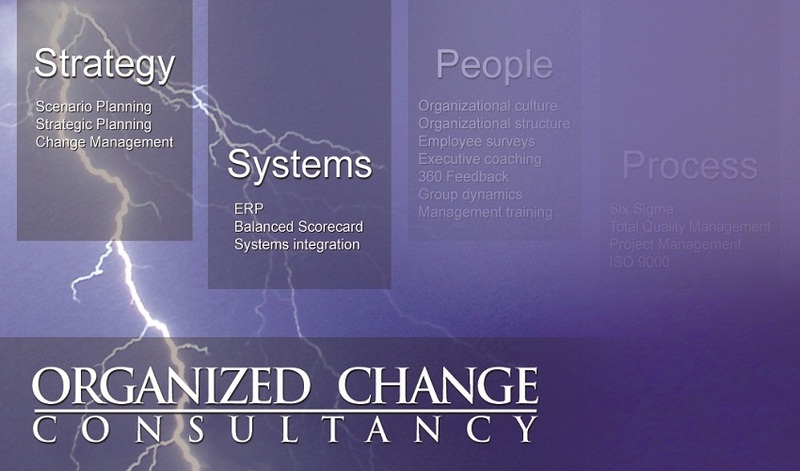 "We have had a very positive experience working with Organized Change. They designed a survey for one of our global teams to help design an organizational change and develop scenarios for our strategies. Organized Change is a dependable collaborator who can be relied upon to help us meet our goals. Almost all of us belonged to some sick organization or another and at times all of us feel frustrated with them. Unfortunately, many of us are untrained in diagnosing what is going wrong in an organization. All we know is that it isn't working well. That sick feeling is from the Stewed Tomato Surprise you had last night, or that disastrous meeting this morning. and recommend a prescription for what ails us. The process has four steps as described below: 1) get started; 2) assess; 3) choose treatments and use them; and 4) periodically evaluate. As in any situation, the first step is to recognize that a problem exists. Doctors call them symptoms; Organizations call them problems. These problems can range from declining productivity, quality or market share; dropped, disappearing projects that start marvelously well and end up in a black hole; increased absenteeism or turnover; group-related problems, such as frequent "Abilene paradoxes", groupthink, poorly run meetings, and frequent head-on collisions of style and priorities among management. At this point, people as patients and organizations as clients often diagnose themselves and take over-the-counter medications. Organizations take the equivalent: a few people go to a seminar and put on some training programs once they come back. This works only if you want symptomatic relief! Organizations often go through the above process many times and for awhile they feel better. Unfortunately, the underlying causes haven't been assessed and changed, so the problem won't go away. People in organizations at this time get another disease: programitis. Programitis is the feeling of cynicism and indifference that happens when organizations plant different buzzword into the minds of employees without following through on implementation. After a few cycles, employees expect nothing from management, and the initial enthusiasm they have drains away. Certainly the behavioral changes needed for teamwork must be done by employees and their management; In other words, the patient has to take his medicine. However, resources may be needed outside the organization to objectively assess the patient's health, provide guidance on treatment options and encourage the patient when he is feeling down. Outside resources are especially indicated when previous attempts by management to solve the problem either don't work or work only for a short time. These well-intentioned but short-lived solutions might include firing or transferring individual team members, training some of the team in meeting management skills, or browbeating/castigating the team. Whoever this outside resource is, s/he should be politically neutral, knowledgeable in team assessment, and able to give guidance on the many treatment options. This person might be from another division, a sister company, or a professional consulting firm. This person should speak frankly and communicate the problems that your employees feel but are hesitant to say. Symptoms within just a few groups. These causes generally focus around the goals, roles and relationships in the team. The team's charter or purpose may be vague, or in conflict with group members (or their department's) priorities. Who gets to do what, group membership, poor group skills and as well as personality conflicts are also potential causes. Symptoms between and within groups. Specific issues can arise between teams that create negative effects inside those teams. Such issues include disagreement over responsibilities, allocation of scarce resources, struggles for political power and the like. A typical triangle of conflict is between Marketing, Engineering and Manufacturing. Symptoms across most of your organization. If illness is prevalent in your company, it implies that organizational systems are a primary cause of the symptoms. Organizational systems such as the organizational structure, compensation, management style, performance appraisal, employee selection process, authority/communication patterns, as well as organizational mission, vision and goals are the major(but often overlooked) causes of organizational ill health. A rule of thumb is that the more widespread the organizational sickness, the more likely that these systems are causing it. Treatments for within-group issues include role clarification, goal setting and problem solving; individual coaching or removal of members; training in small group skills; and possibly disbanding the group. Methods to treat inter-group issues include 1) inter-group teambuilding, where warring departments discuss their conflicts and agree upon solutions; 2) establishing cross-functional teams and matrix organizations to deal with "bridge" issues that cut across organizational lines; 3) and merging or dissolution of the groups. Methods to treat organization-wide teamwork problems include changing organizational structure to a more product or customer-based focus, and away from the functional stovepipes; instituting gainsharing or profit sharing instead of individual merit reviews; changing market focus and the organization's strategic plan; and including line workers on the design and development of products. Increasing organizational health is not a one-shot effort, but is continuous and on-going. Measures of success (such as re-assessing organizational health) should be established, and periodic checkups done at one, three, six and 12 months. If the organization progresses, these checkups can become less frequent; they may be more frequent if organizational health start to go downhill, or if the company faces new challenges.